WASHINGTON (Feb. 09, 2009) -- More than 50 retired and current female general and flag officers attended a lunch in honor of Gen. Ann E. Dunwoody, Saturday, at the Women in Military Service for America memorial at Arlington National Cemetery. In November, Dunwoody became the first female officer in U.S. military history to earn a fourth star. She currently serves as commander, U.S. Army Materiel Command. Gen. Ann E. Dunwoody meets with Rear Adm. Liz Young and Air Force Maj. Gen. Ellen M. Pawlikowski during a lunch in her honor, Feb. 7, at the Women in Military Service for America memorial at Arlington National Cemetery. 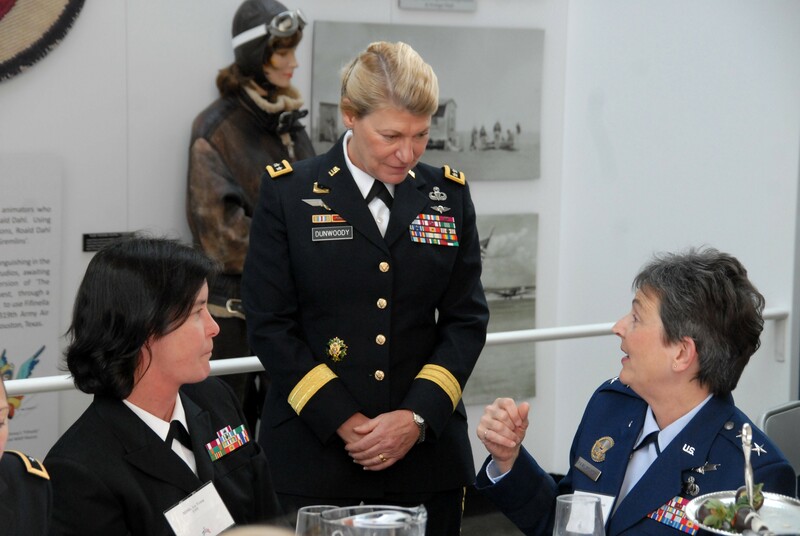 Attending the lunch were other "firsts," including retired Air Force Maj. Gen. Jeanne M. Holm, the first female officer to achieve the rank of major general; retired Vice Adm. Patricia A. Tracey, the first female officer to earn a third star; and retired Marine Corps Lt. Gen. Carol A. Mutter, the first female officer to be nominated for a third star. The lunch event was hosted by Women's Memorial Foundation president, retired Air Force Brig. Gen. Wilma L. Vaught She said that female veterans who come to visit the WIMSA memorial are proud of their service, and are now proud to see a female officer promoted to the military's highest rank. "Having been involved with the memorial for the past 21 years, I have seen the pride of women who served in World War I, World War II and those who served today," she said. "Now I hear the excitement in their voices and in the words they wrote about (Dunwoody's) selection to four-star. It meant something to all of them -- almost like they were promoted too. And so it is something special for every one of them." Dunwoody told attending generals that breaking barriers is nothing new for the armed forces. "We all know that breaking barriers, shattering glass ceilings, brass ceilings, and rewriting history, is nothing new for the armed forces. Especially for ... pioneers like General Hays, General Holm, Admiral Tracey and General Mutter," she said. "We've all led the way, and in leading, you've given us all something, all women who seek to serve their country, a gift beyond measure -- that's the gift of limitless opportunity. Your courage, your trailblazing, your devotion to our country stands out not just for women, but for all who are proud to wear the uniform." Dunwoody went on to say that in the armed forces, the services do not care about background, or where a service member comes from -- but only for where that person has the potential to go. "We are living proof that we are part of a joint fighting force that values consistent performance, willingness to learn, capacity for growth, and most importantly, potential to lead," Dunwoody said. "And when the opportunity was there, everyone in this room responded." The new general also said that passing leadership skills down to junior officers is the responsibility of every leader, officer and enlisted member, male or female. "It is critical and incumbent on us as leaders throughout the chain of command to continue to encourage, mentor, and coach men and women as they come up through the ranks," she said. Dunwoody also said that despite their advances in the armed forces, women in service today still face challenges -- but not challenges the Army isn't already working hard to address. "We have to ensure that each and every Soldier is treated with dignity and respect -- we have had challenges with dignity and respect -- and we have had challenges with sexual assault issues, which we are now addressing with great vigor," Dunwoody said.